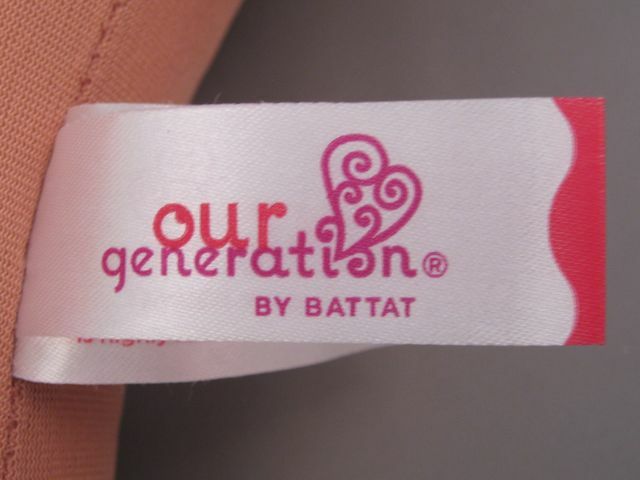 The Our Generation dolls are made by Battat. 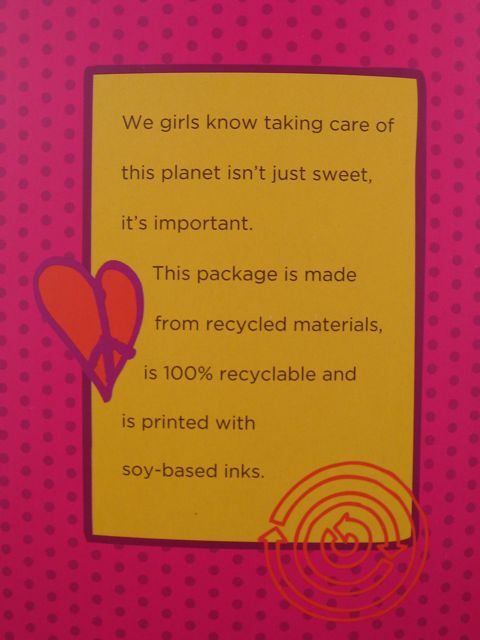 This is the company that makes Li'l Woodzeez. They also make an awesome-looking toy called "Symphony in b" that I want to buy for my niece. 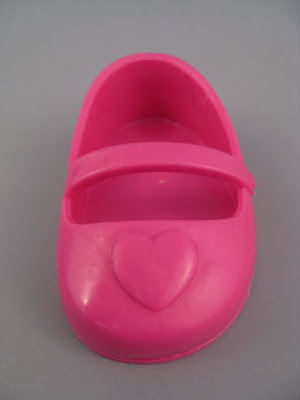 It reminds me of this wonderful little Zizzle Zounds music toy that my kids have, and another great muscial block toy by Neurosmith that they had when they were younger. Good stuff. Anyway...the doll. 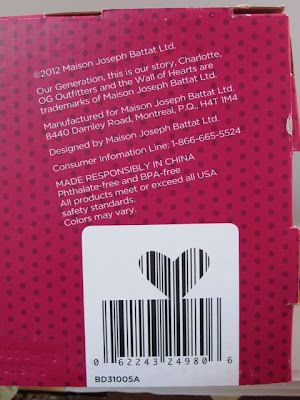 I guess I haven't looked very closely at the Our Generation dolls and their packaging for a while. 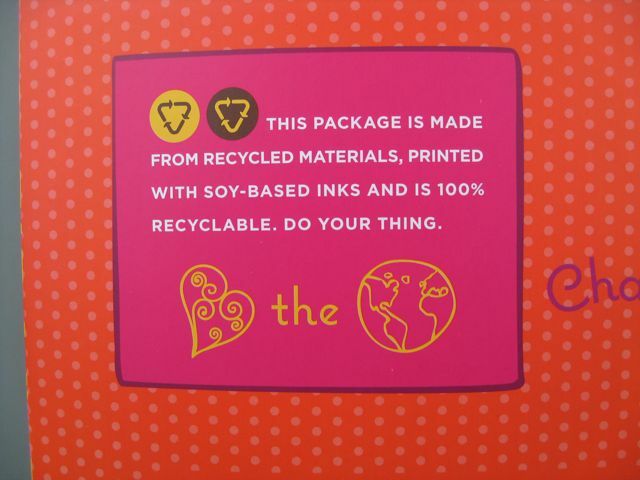 The packaging is really nice, and the company seems to have adopted an eco-friendly, charitable approach that I like. 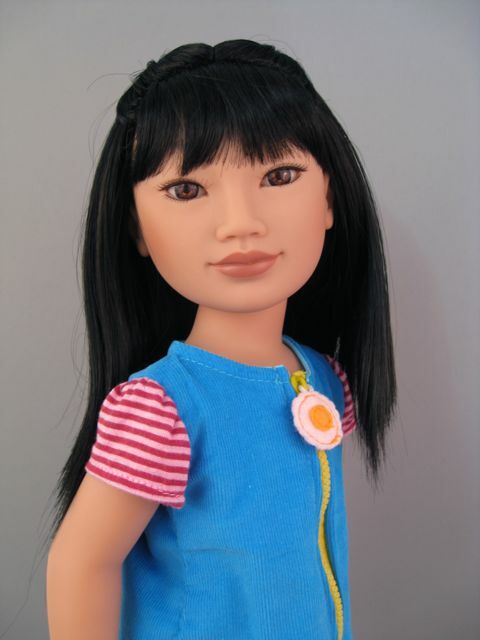 Our Generation could have been included in my Charitable Doll series with Hearts 4 Hearts Nahji and Karito Kids Ling. There's a lot of reading to do on this box. 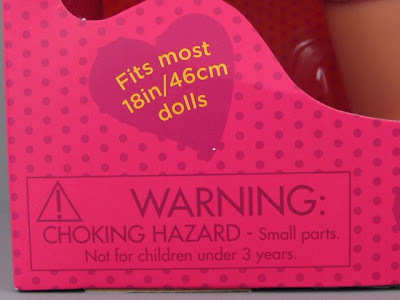 On the front, it says, "Fits most 18in/46cm dolls." 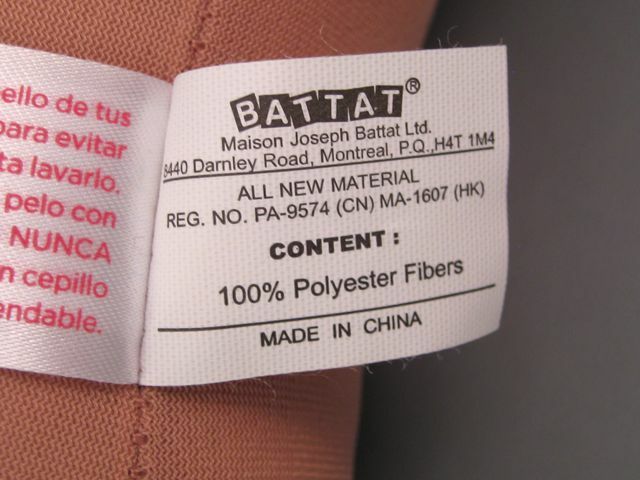 With this, I assume they're referring to just the clothes on the doll, not the whole doll. 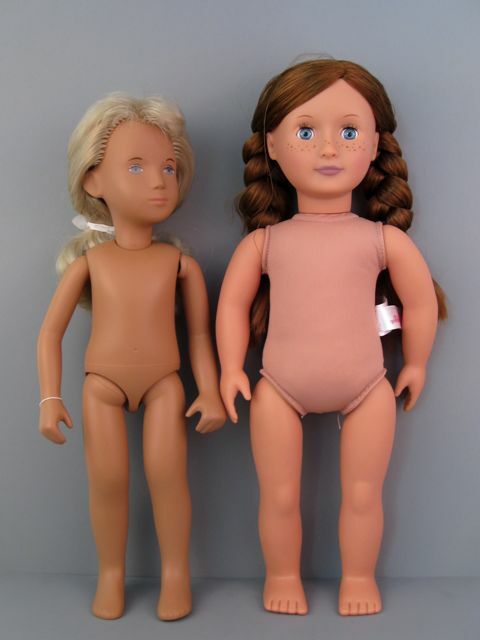 The idea of the whole doll somehow fitting other 18" dolls conjures some very Silence of the Lambs skin suit ideas in my head...but maybe that's just me. 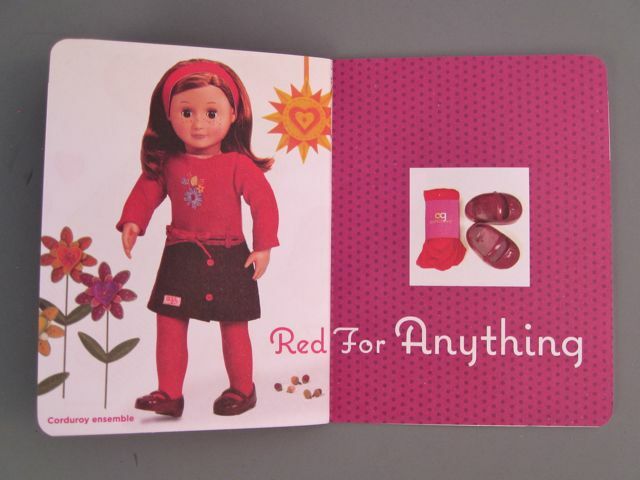 Why not just say, "clothes fit American Girl dolls?" Following this letter is Elizabeth's story. 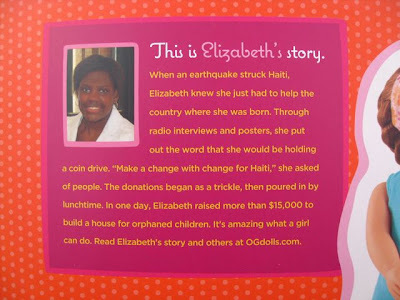 Elizabeth is a 12-year-old girl who raised $15,000 to help earthquake victims in Haiti. There's a slightly more detailed version of Elizabeth's story on the Our Generation website. I tried searching for more about this story on the internet, but couldn't find anything except for what was on the OG site. This made me a little suspicious, so I did some more investigating. Some of the other real-life stories are clearly true (and inspiring! ), so I actually think Elizabeth is a real person. Very cool. 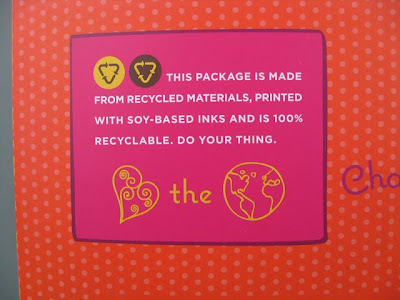 The box is not only recyclable, but it is made from recycled materials and printed with soy-based ink, which may (or may not) help the cardboard break down faster. The last two blurbs aren't quite as interesting--one is repetitive and the other is just contact information. Their friendly wording in the contact box does kind-of make me want to dial that number and say, "Hey. I just called to chat." 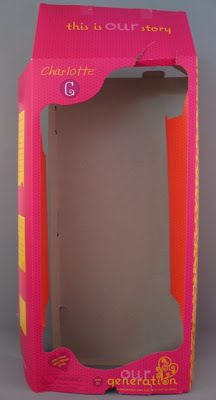 The box has an outer cardboard frame that can be removed by un-taping and disconnecting tabs all along one side and across the top. Ripping would work well, too, if you had no desire to preserve the box. 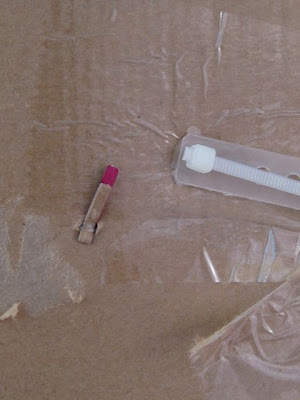 The inner box has two cable ties holding the doll in place and a small catalogue taped to the back. On either side of the top cable tie is a tiny piece of cardboard that looks like a matchstick. 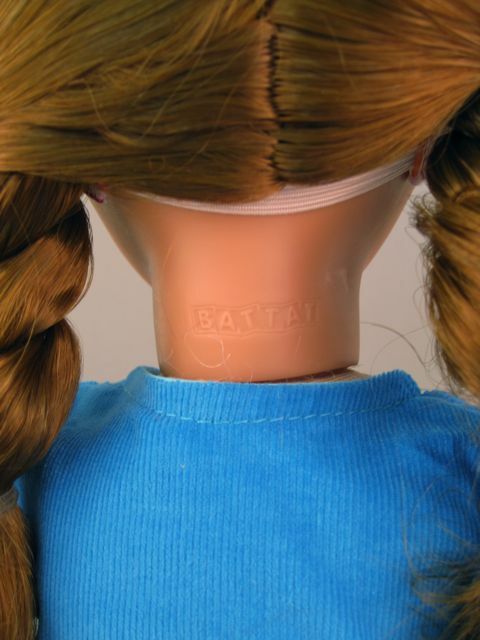 These are attached to the doll's braids to keep the hair from flopping around. It's a pretty clever system and very easy to get undone. The bottom of the box has a creative barcode and the Battat company information. 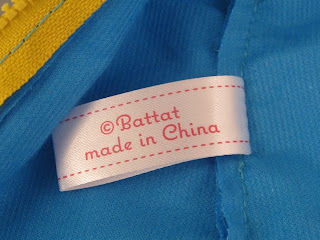 Battat is a Canadian company, and I love the French wording, "Maison Joseph Battat." It sounds very fancy. 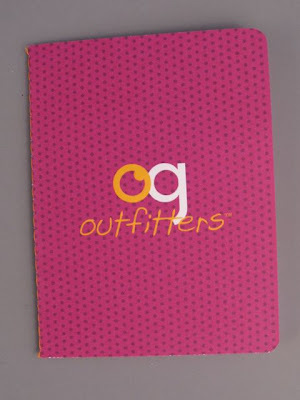 The little pink catalogue says "og outfitters" on the front. 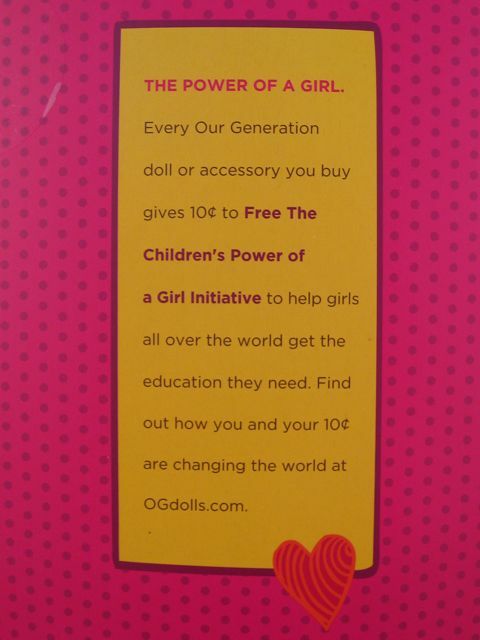 Our Generation is a nice name for the doll line, but "og" is not the best acronym. It's a bit like a zombie grunt. 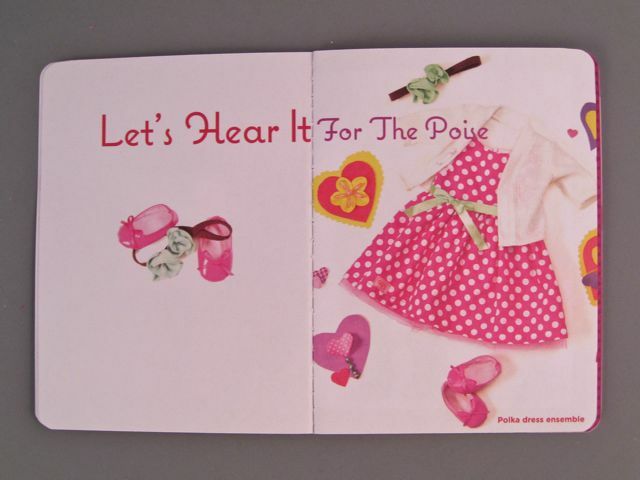 "Let's Hear it for the Poise" is also a cute outfit, but will kids get that reference? I mean, Footloose is a great movie, but I haven't seen it for 20 years. Give the poise a hand. 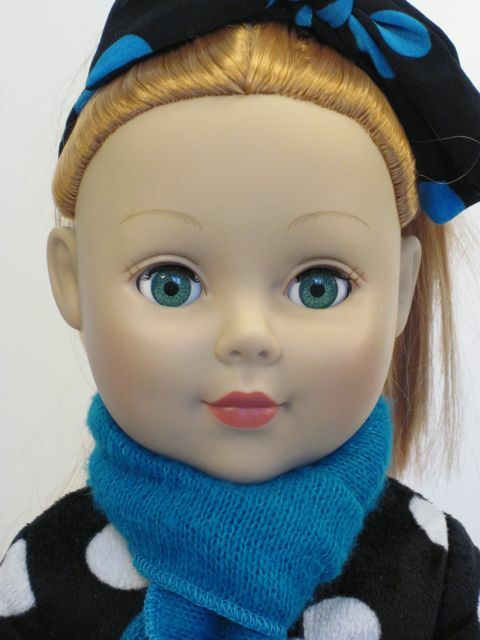 She has cornflower blue sleep eyes with applied upper eyelashes and no painted lashes. Her eyebrows are very thin and short and don't attract a lot of attention. 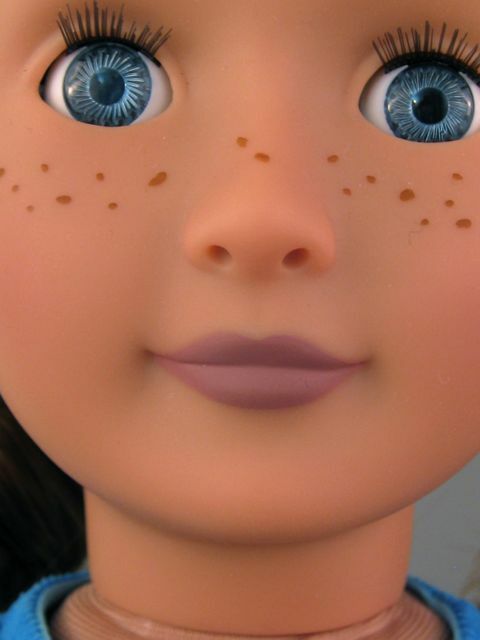 She has just the right number of freckles, and the freckles have a realistic shape, rather than just being circular dots. 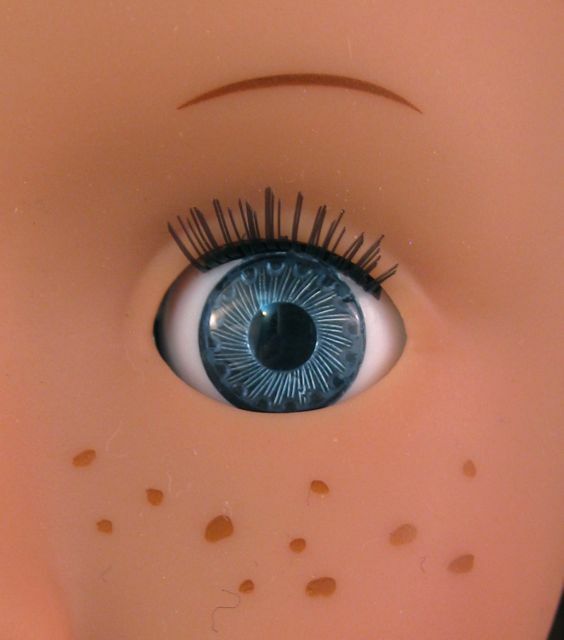 My doll's eyes are ever-so-slightly askew, with a wandering left eye. I suspect that "cornflower blue" popped into my head because these irises have a very flower-like design. I don't know if all of the Our Generation eyes are like this, or if Charlotte's eyes are especially flowery because of her floral outfit. The sleep eyes work fine, but they rattle around a bit. Also, the eyelid color is not a great match to the vinyl of her head, and the eyelashes prevent the eyelids from closing completely. Charlotte's medium auburn hair is styled into two chunky, casual braids. She has an off-center part in front that I think is intentional. I like that her flower headband coordinates with her outfit but doesn't match it exactly. 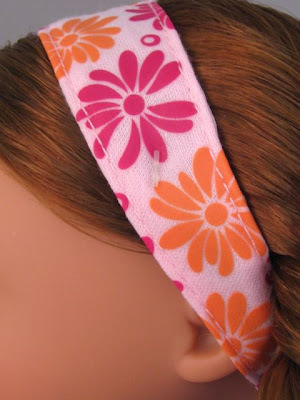 The headband is secured to her head with two small plastic ties. 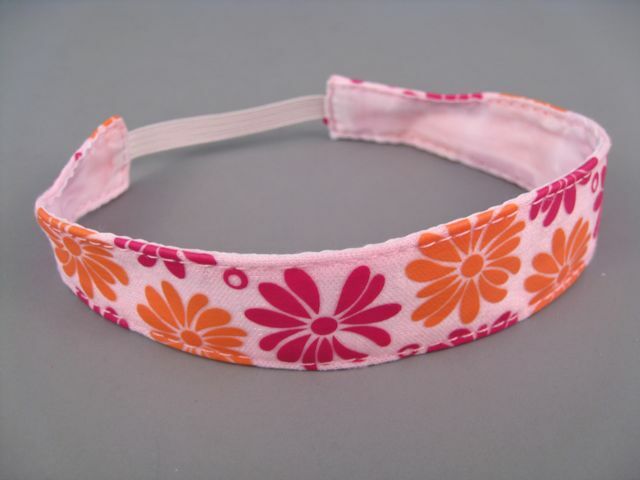 The headband is made out of a lined fabric with orange and pink flower designs. The one-piece dress is made out of a lightweight blue corduroy with contrasting knit sleeves. 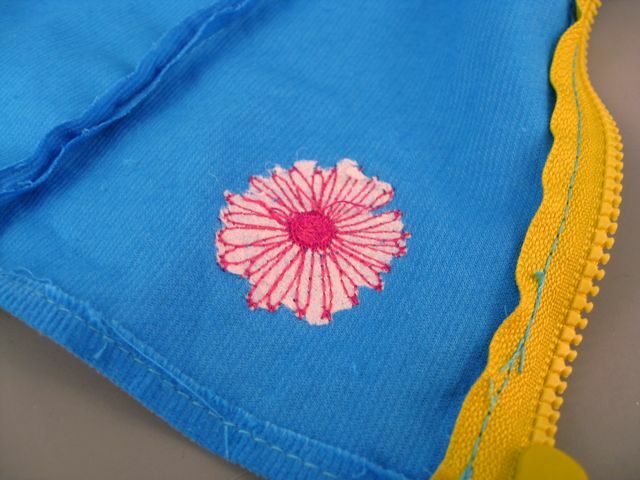 The dress opens down the front with a long, bright yellow plastic zipper. 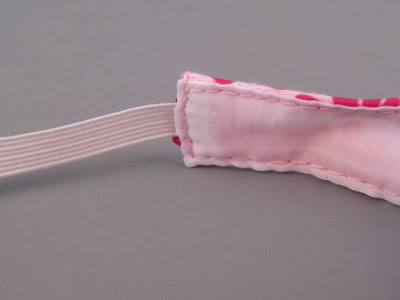 The decorative zipper pull is made out of felt and is stitched to the top of the zipper, presumably to keep the dress from being unzipped or removed at the store. It's a little alarming to unzip the dress and find nothing underneath. I guess I am more used to unzipping things like coats and sweatshirts that tend to be worn over other items of clothing. 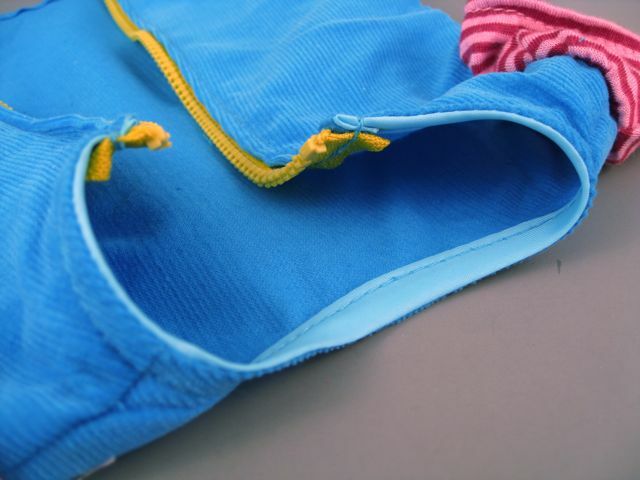 The leggings have a velcro opening in back, but they can also be slid on and off without unfastening this seam. Thinking she might be something of a gymnast, Charlotte attempted "the bridge:"
I am not very impressed with Charlotte's posing repertoire--she couldn't even sit on a chair in a believable way. I really wish I had seen one of the newer poseable Our Generation girls at the store, because those dolls would probably be a better fit for my articulation hang-ups. Charlotte's dress looks cute on Rapunzel. 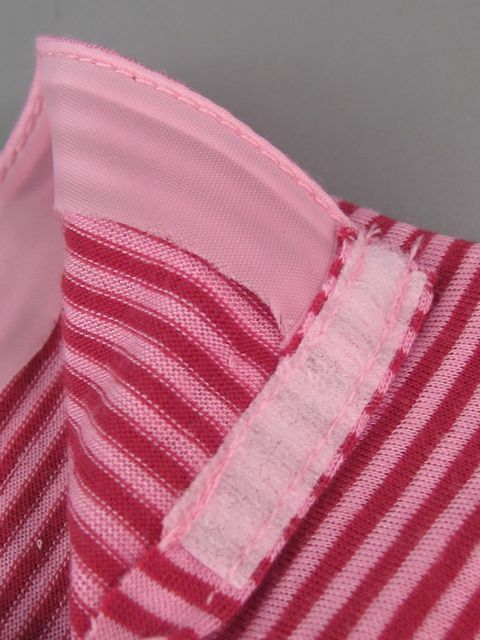 It is a bit loose, but for this style of dress, a perfect fit is not essential. 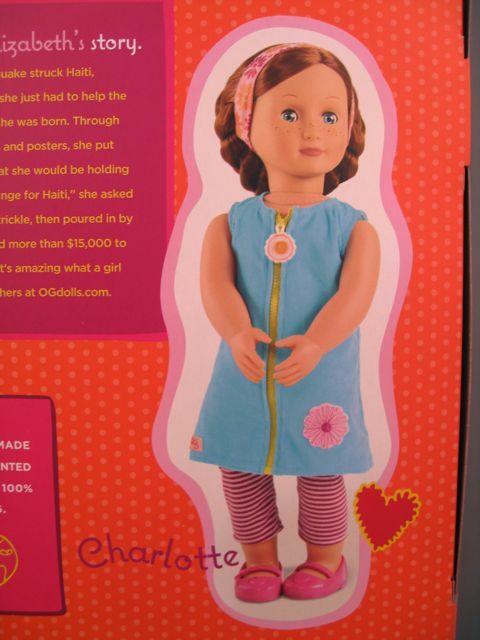 When I look at these two dolls together, I like Charlotte quite a lot more. Her clothes are of much higher quality and are more versatile. I like the shape of Rapunzel's body better, but that's probably because I am used to collecting fashion dolls. Charlotte's cloth torso makes her more huggable and easy to hold. Charlotte's face is a bit generic, and her lips are a bad color, but she makes Rapunzel look really bizarre with those huge eyes and blocky eyebrows. Charlotte is about the same height as my EuroGirl and Carpatina Erin. Erin and Charlotte have similar coloring. It's not really fair to compare Erin to Charlotte, since Carpatina dolls cost three to five times as much as the Our Generation dolls. 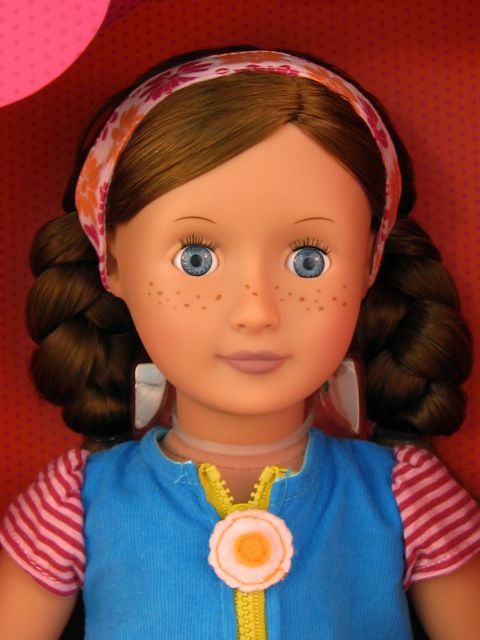 However, owning Charlotte makes me appreciate what a beautiful doll Erin is. That's not necessarily meant to take anything away from Charlotte, it's just that by looking at Charlotte, it's easier to appreciate the steps that were taken to make Erin a high quality doll. 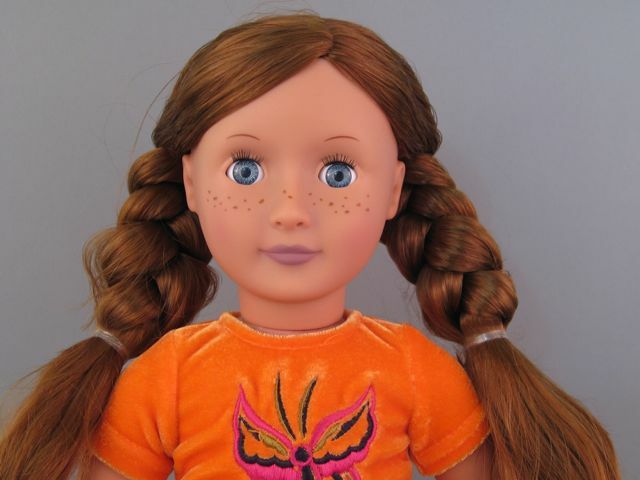 The only ~18" play doll that I was interested in as a child was Sasha. Here's a picture of Charlotte with Sasha, just for fun. They can't share clothes. I've never mentioned this doll before, but I want to show her to you now as another contrast to Charlotte. 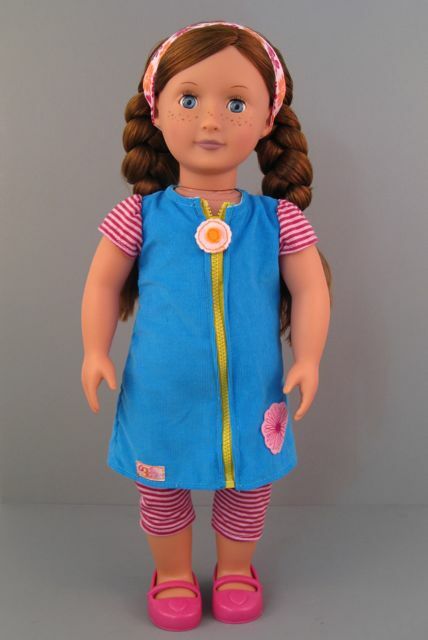 This is a Madame Alexander "Friends Boutique" doll from Walmart. They've replaced these dolls with the My Life line now (which might be way better, I don't know). 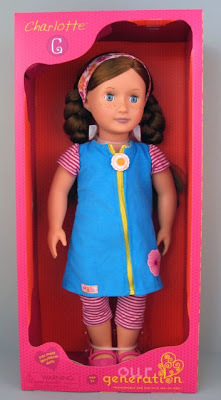 This doll cost around $30 and was so awful, I couldn't bear to review her. She smelled really chemically, her hair was a nightmare, and her clothes were made of incredibly cheap materials that I didn't want to touch. She looks good, but looks can be very, very deceptive. 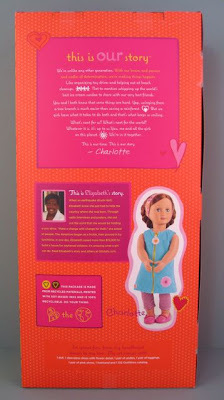 I suspect that Charlotte can also share clothes with American Girl dolls. She fits well into the Springfield Collection outfits I have, and those are supposed to fit American Girls. I had to cut that beast out. There was no way I was going to get it untangled. 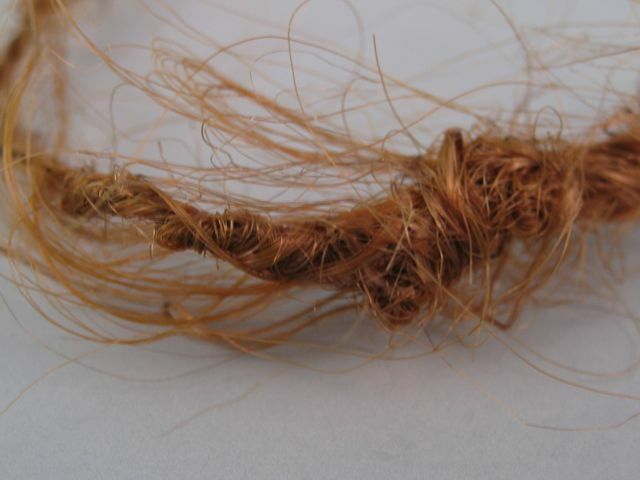 It looks like her hair got twisted by a piece of machinery or something. Ouch. The rooting is organized into neat rows near the face, but then gets more random towards the back. 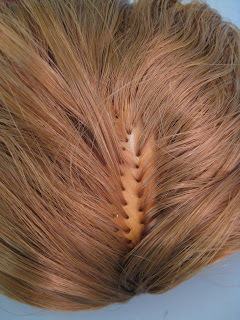 The density of hair plugs is good and the scalp doesn't show during normal play. Bottom line? It is clear to me that a lot of effort was put into making this doll as good as she could be for the price. 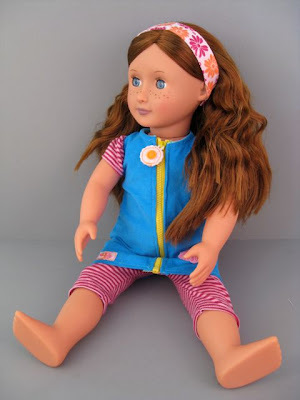 She is the least expensive 18" play doll I have ever bought, but she would be at the top of my list if I were shopping for a young girl. Charlotte's face is what attracted me to her in the first place. 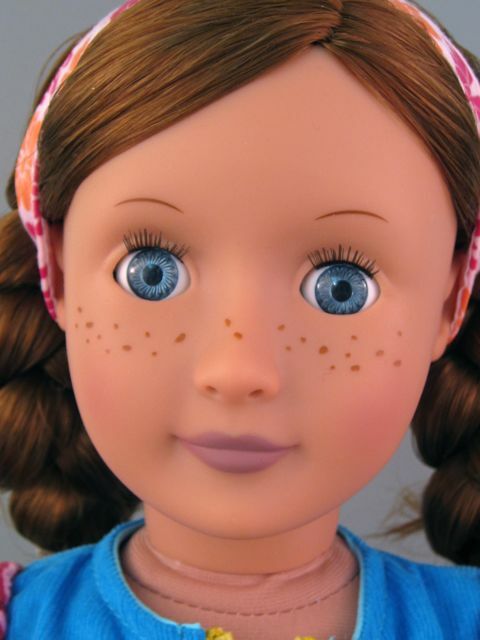 She has pretty blue eyes that open and close, realistic freckles and a cute smile. The only problem with her face is that her lips are too purple. She has a nice, thickly-rooted mane of red hair that is easy to brush and can be styled into braids, ponytails, or just left down. 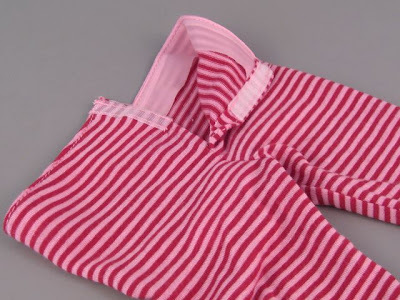 Her outfit has two cheerful, well-made, age-appropriate pieces sewn in fabrics that feel soft and natural. 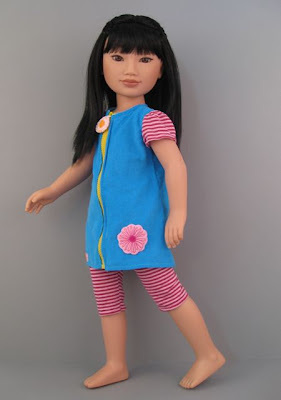 Her clothes fit most of my other 18" dolls. Her body is chunky and lacks detail and flexibility, but she is easy to handle and her body looks sturdily constructed. 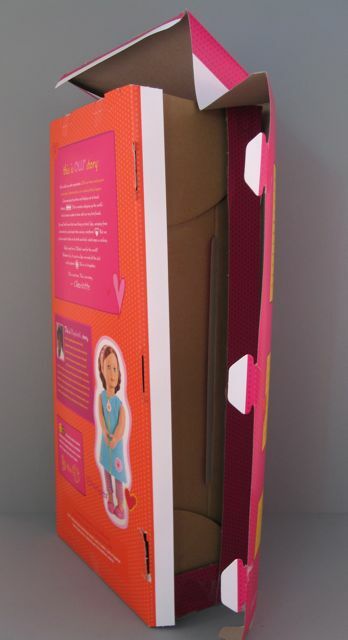 Her box is simple and environmentally friendly. 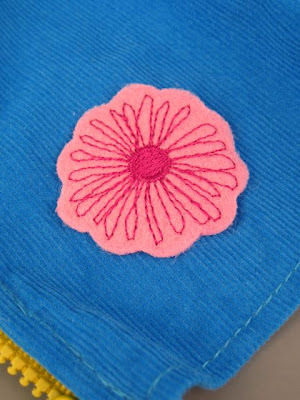 As an added bonus, purchasing Charlotte donates a small amount of money to an inspiring charity organization that was started by a kid and works to help children all over the world. 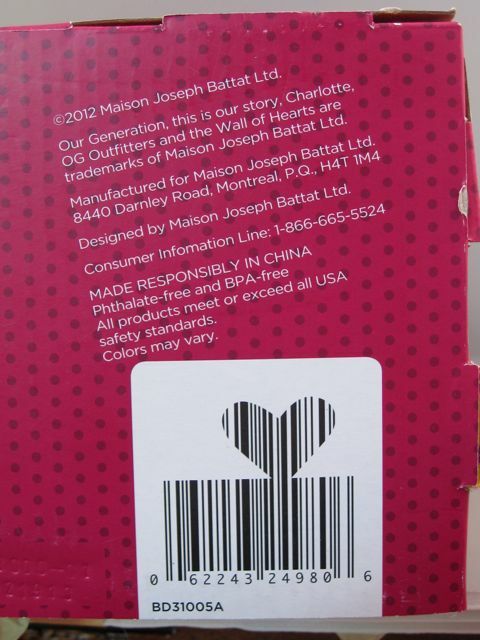 The box and the connection to charity round out what is already a wholesome and appealing image. 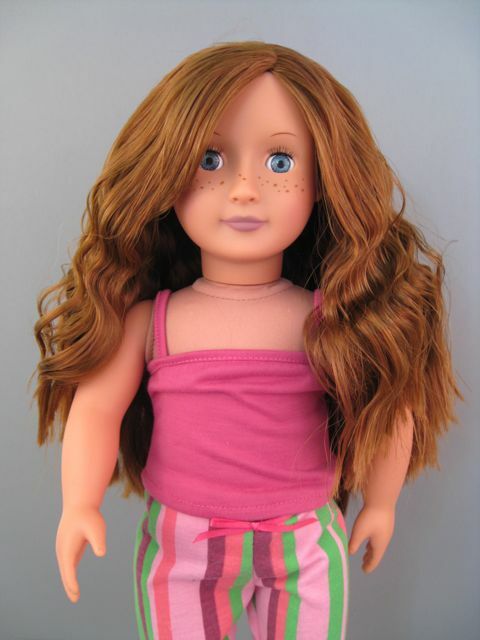 The high end 18" play doll market can be incredibly expensive. One of the reasons that I don't own an American Girl is that every time I visit that store, I seem to end up with $200 of merchandise in my cart before I even get started. It is refreshing that there are some significantly less expensive options on the market. Less expensive options are only attractive, though, if they have something appealing to offer at a decent level of quality. Charlotte meets those requirements very nicely. 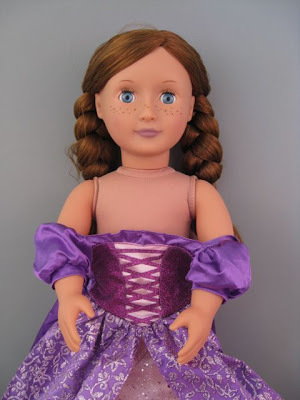 This doll is a much better option than the Princess & Me Rapunzel, and certainly a better deal than something like the Friend's Boutique doll. 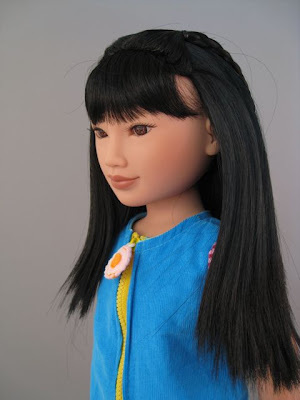 I am happier with her quality than I am with my poorly-wigged EuroGirl. She can't rival Carpatina Erin or Karito Kids Ling, but she is more equivalent to them than her price suggests. 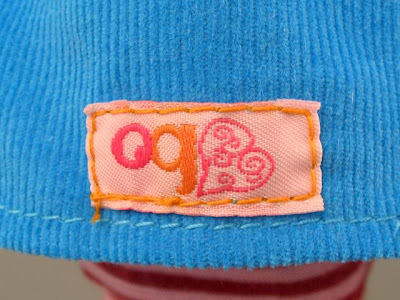 My guess is that younger kids won't notice Charlotte's quality shortcuts as much as parents will appreciate her price. I am impressed enough with Charlotte that I am excited to look at one of the slightly more expensive poseable Our Generation girls. Those dolls might be a really outstanding option. 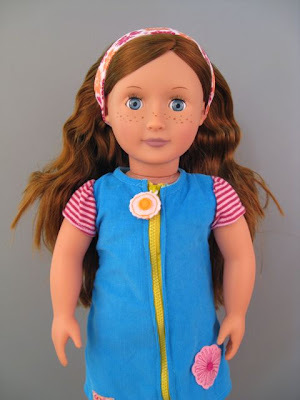 For now, though, I'll enjoy this redheaded cutie who cost less than one American Girl outfit. Great value--especially at the sale price of $18.99. This doll is well constructed. Time was clearly put into giving her an appealing appearance and image. 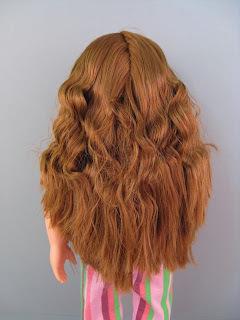 She has soft, thick hair that is easy to manage. Her face is nicely painted, with the exception of her lips. 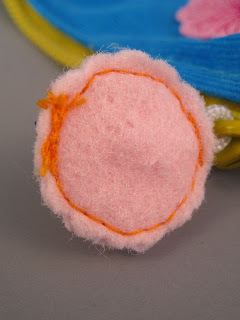 Her eyes have three dimensional detail and can open and close. Her body is blocky and lacks articulation. 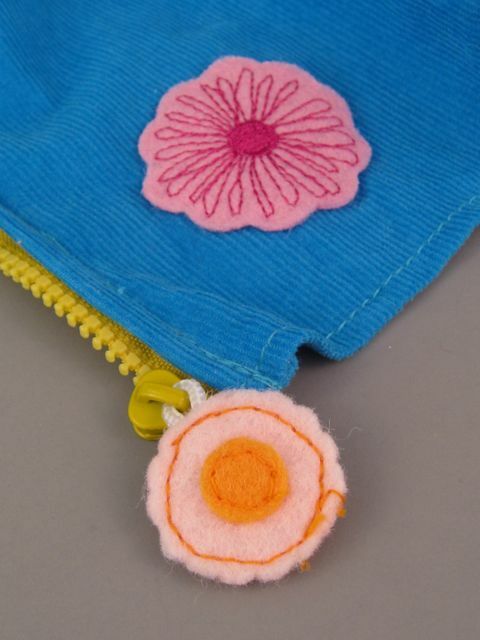 Her clothes are colorful, well-made and age-appropriate. Excellent. The box is all cardboard with only two cable ties holding the doll. Efforts have been made to choose environmentally friendly materials. No. 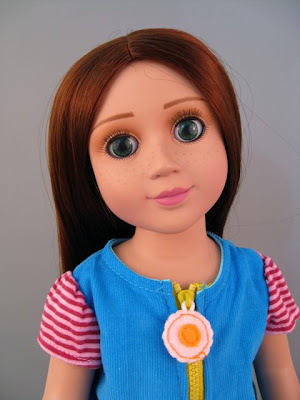 This is a budget play doll. Her generic face and wardrobe make this doll highly versatile. 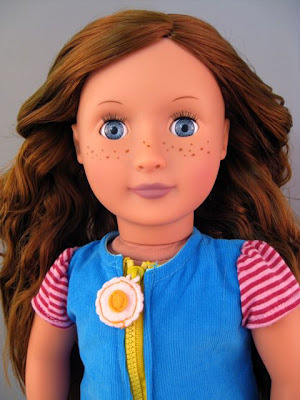 She could take on a range of personalities, and be mixed in with collections of other 18” play dolls. She is equivalent in size to American Girl dolls, and can share her clothes with many of the slim 18” dolls. She can not wear the 18” slim clothes in return, though. Based on Charlotte’s price, I had pretty low expectations. 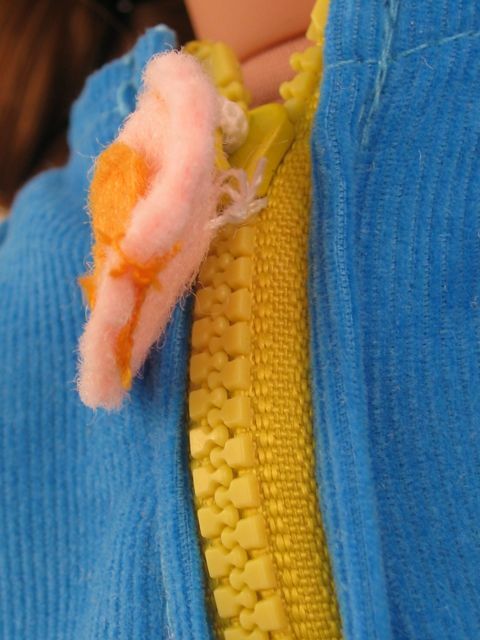 I ended up being impressed by the attention to detail in this doll. Her face is appealing, her hair is good, her wardrobe is fun and well-made. The whole line has a nice, positive, modern image. If she had a little bit more articulation, she would be wonderful. 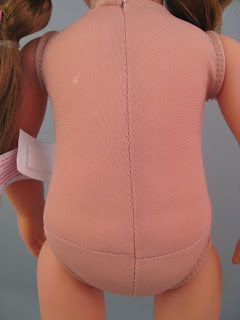 The idea of the whole doll somehow fitting other 18" dolls conjures some very Silence of the Lambs skin suit ideas in my head...but maybe that's just me. Now I have an image of an Our Generation/AG/Journey Girl/etc etc cast of the series "Hannibal." 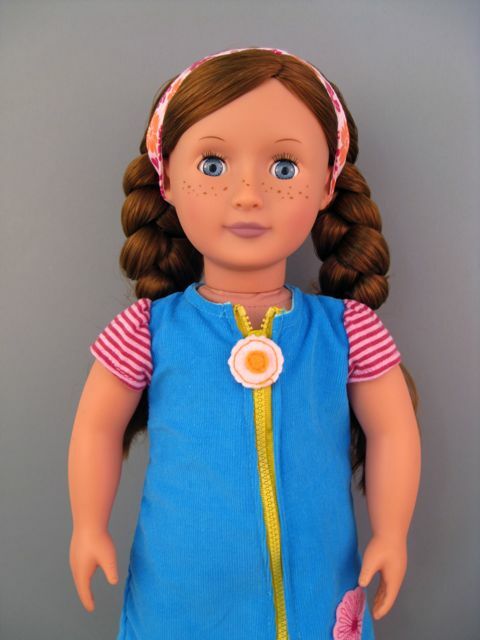 I have an American Girl doll myself that I just got in late March/early April. I can tell you this much about Our Generation clothes: They fit AG like a dream. Here's a couple picts to show how well they fit. In case you can't tell, much like my Pretty Pony Princess Problem, I also have a Polka Dot Problem. I can quit anytime I want, stop looking at me like that. Anywho, as you can see they fit like a glove, and she rocks them too! 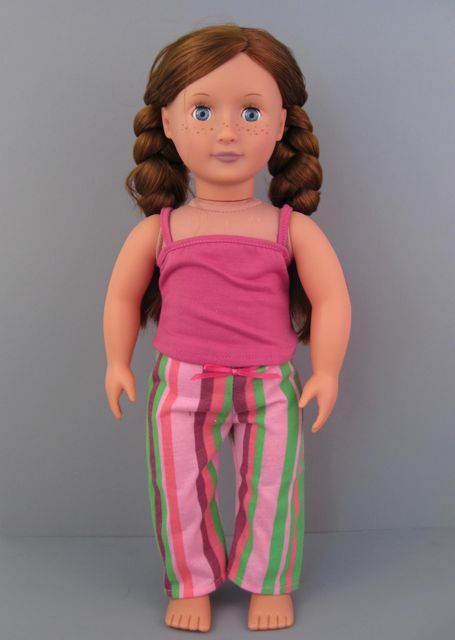 I've walked past Our Generation dolls many a time in Target - they're just up the aisle from Monster High in my local store - but I've never bought one. Yet. Maybe someday one will speak to me. Well, pissysnots. I had written you a comment and it deleted itself. Or went to spam because I put in links to pictures. I don't even know. Internet, how does it work. Anyway! Yes, OG dolls are lovely! And their clothes do fit AG dolls. Really well in fact. 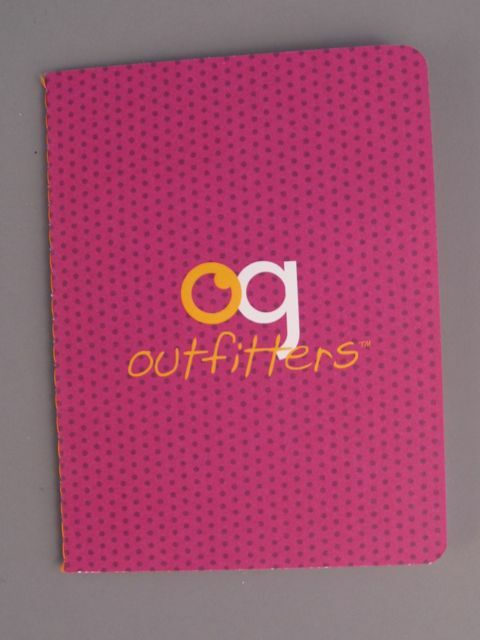 They're a great cheaper alternative to AG clothes. I had pictures before but I guess your spam filter didn't like them so I won't include them again! But yes, they look great on AG. I've never tried it the other way, but I have a feeling I might get that chance sooner rather than later. If my Target ever gets an OG doll other than the blonde one, I might just have to snag one up. 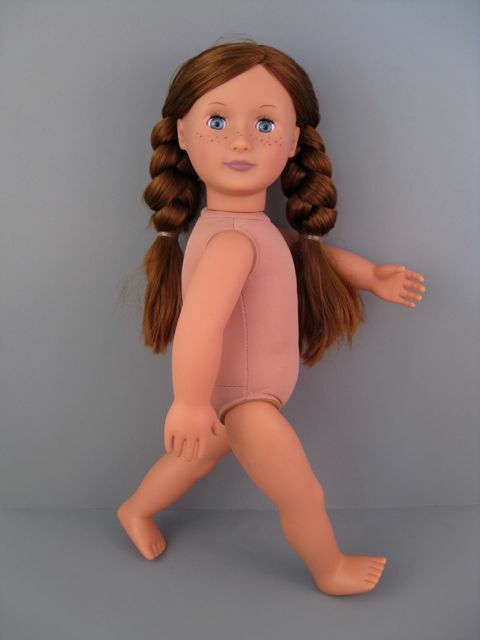 Also: The idea of the whole doll somehow fitting other 18" dolls conjures some very Silence of the Lambs skin suit ideas in my head...but maybe that's just me. Made me think of a various 18 inch doll cast of the series "Hannibal" and I giggled so hard I had to get a drink of water. 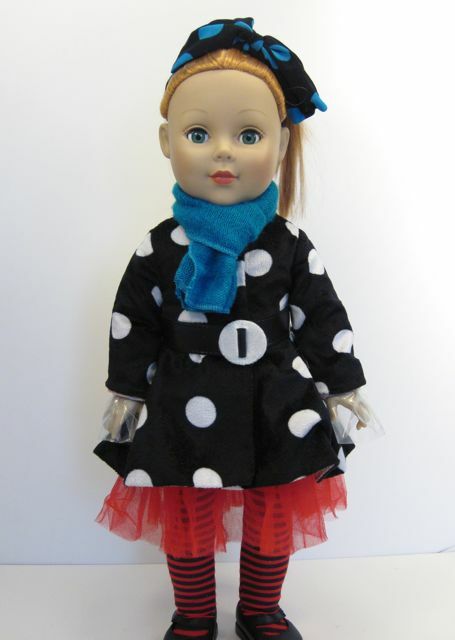 I see your polka dot problem and raise you a redheaded doll problem! I love those polka dot outfits, though! They are super-cute, and look great on your American Girl. I especially like the orange skirt. 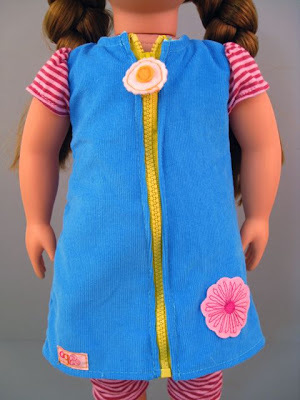 Makes me want an American Girl more--she'd be less expensive to dress than I feared! I looked at the OG dolls in stock at Target this morning, and you're right about that one blonde gal, Daisy--there were about ten of her and only two or three others. I tend to like the non-blondes, but there's an articulated blonde with riding clothes that appeals to me. I really, really, really really, want one of the Our Generation articulated horses, but they are sooooo big. I apologize on behalf of my temperamental spam filter--hope that doesn't happen again! 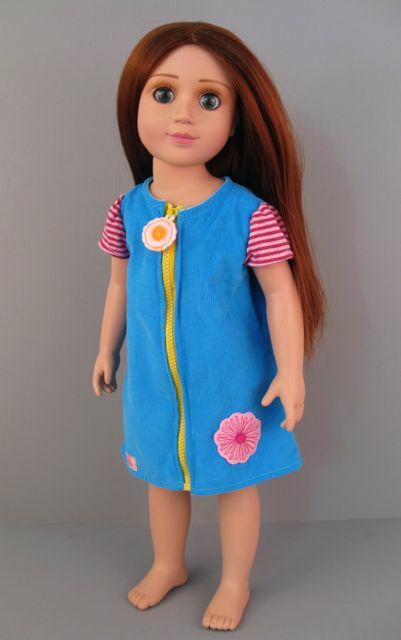 If you get an AG doll? Let me give you a suggestion. 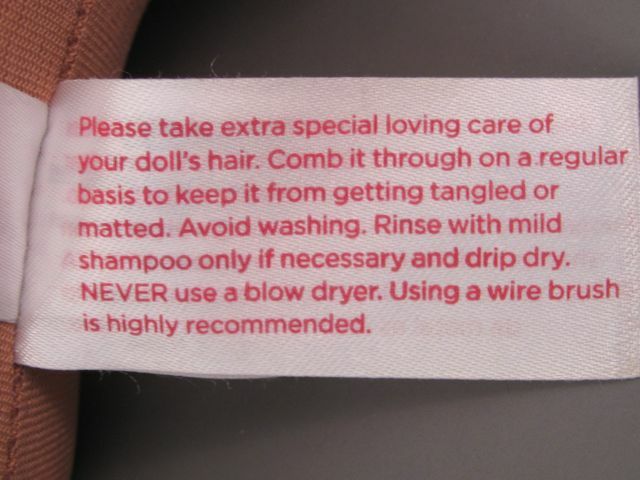 It'll work on any doll with synthetic hair actually. My Little Pony toys too. Remember Nethilia, who commented here with her custom job on her Bratzillaz Switch-a-Witch? The woman is an AG expert, and the best stuff in the world to use on their hair? 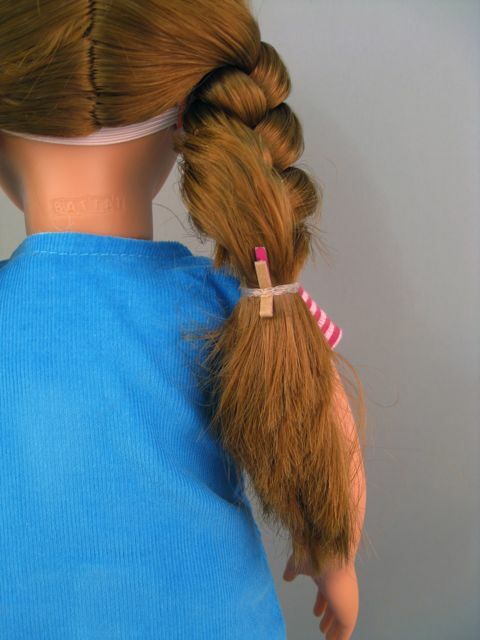 Braid Spray. Go to whatever beauty supply shop - down here where I live it's Sally - and look in the "ethnic" section and find "Braid Sheen Spray." It's about four bucks for a good-sized bottle. 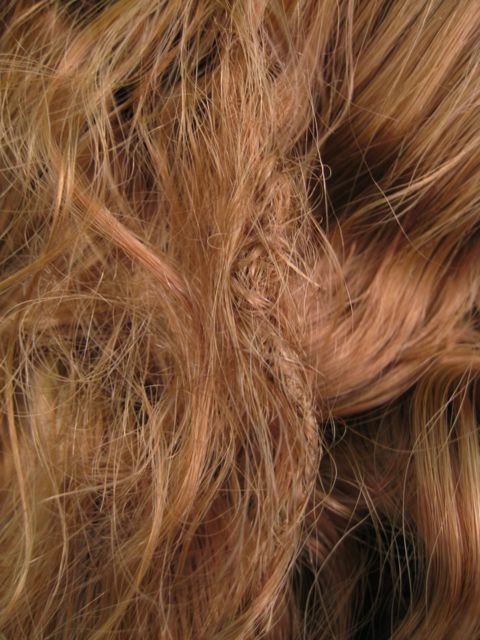 It is made for synthetic hair. Couple of pumps of that combed through a doll or pony's hair and it looks shiny, feels soft and smells good too! Seriously, miracle stuff. I'll send Neth over here when I see her later to chime in on this as well, because she knows a lot more about it than me and my "Uh... it makes it look purty..." She recommended it to me for pony hair care and I've never looked back. 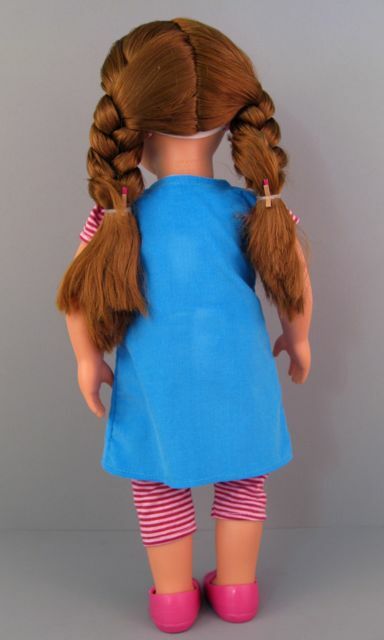 I have heard so much about the hair on the American Girls, I find it intriguing! A spray bottle? I will definitely take your advice when I finally get Saige or Rebecca (but which one? Ahhhh!! Maybe I'll start a poll...). 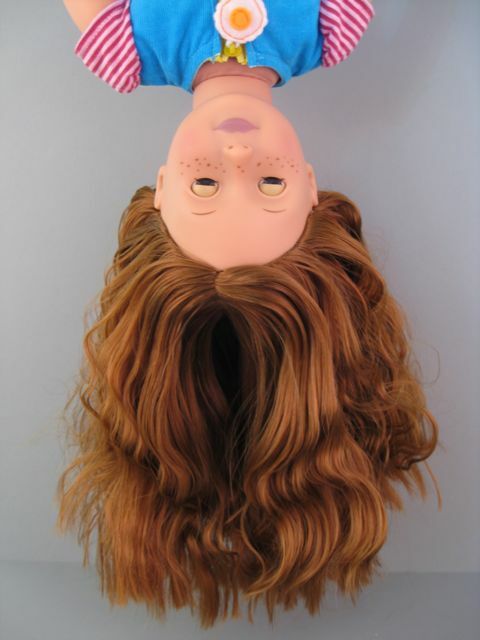 The problem with the less expensive play dolls is almost always in the face, don't you think? They don't have the personality of the more expensive dolls. Charlotte's face seems much more charming to me than other dolls in her price range, but I have certainly been in your place where there's just something about a face that I can't get past--like the Springfield dolls. I do not care for their faces. Thank you so much for the tips and the feedback about Saige and Rebecca! I guess I've been spoiled by AG, because most OG faces look weird to me now. 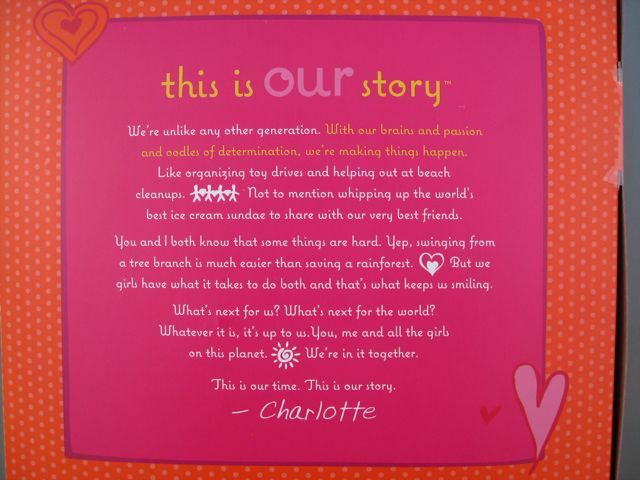 But Charlotte's is really cute, and I like it. I was honestly pretty worried about getting OG clothes because Springfields look so nasty and cheap, but after this review, I might give OG outfits another look. Emily, be sure to use the spray bottle for Charlotte's hair too, if necessary! Just get one of those little "travel size", EMPTY(LOL), hairspray bottles. It doesn't take much, mind u. Their hair does get mussed a little easier than AG, but my girls love them just the same, and play with them just as much! 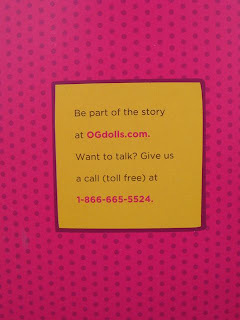 We used the OG dolls as a starter doll, before we spent the BIG MONEY for AG, especially since we have 2 girls! We also LOVE, LOVE, LOVE their HORSES AND FOALS!! My 8 yr old is a horse freak!! Their other accessory sets are AWESOME and a much cheaper alternative to the ones from AG. I recommend OG to lots of our friends who don't have the means to afford AG, and we have given a few as gifts as well! 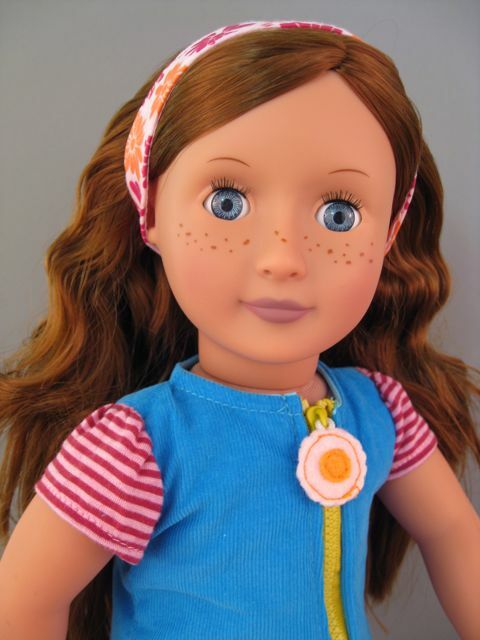 Charlotte is my exact twin, down to the freckles! I've always wanted her! My hair is more chestnut, but its pretty close. Oh--I like the look of the Journey Girls, too, Marta! I have one of those waiting patiently for her review. :) I'm sorry you can't buy the American Girl dolls in Spain. Not even online? 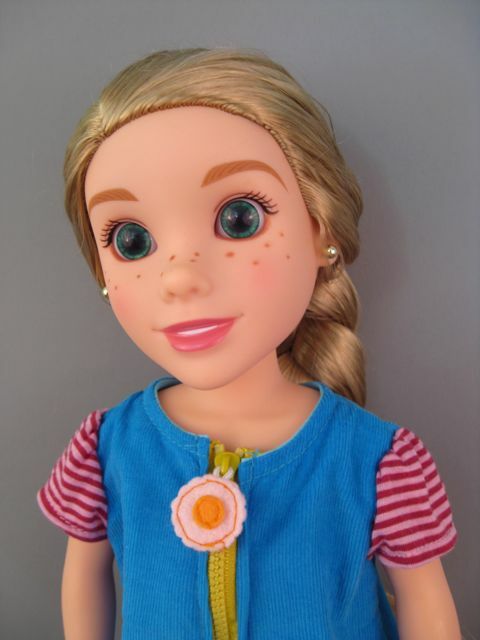 Ciao from Italy,I had the same problem of Marta,but I had the chance that some one bring me the dolls,now I have 3,Julie,Saige and a MyAG.There is an english web site that mail the dolls in Europe,but is a little bit expensive. Between Saige and Rebecca I prefer Saige,but she's very symilar to Charlotte. 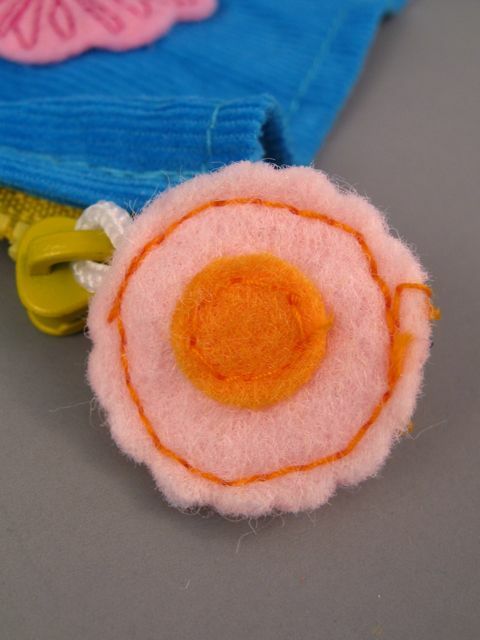 You mentioned how the zipper pull looks like an egg and now I can't unsee it... :D Why do you have to be so funny? I'm addicted to your reviews, even those of dolls I would never like. You're not alone! I like her reviews so much I read even the ones for dolls I know I would never buy. 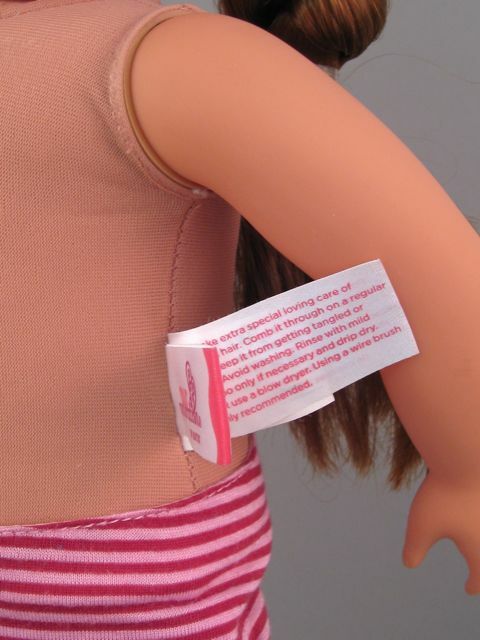 I've never seen an Our Generation doll out of the box, so I found your review very helpful. Every time I pass them on the shelf something about the doll's face freaks me out... they feel so blank to me... almost too generic, as though they are devoid of life. Never the less, I've found the Our Generation clothing and accessories to both be of surprisingly high quality, considering the price point. Quick note about expense: Decent-quality AGs come up for sale on eBay fairly often, for a surprisingly low price. The Girl of the Year dolls tend to cost a LOT after their year is up, but the historicals and MyAG tend to be pretty inexpensive on eBay. 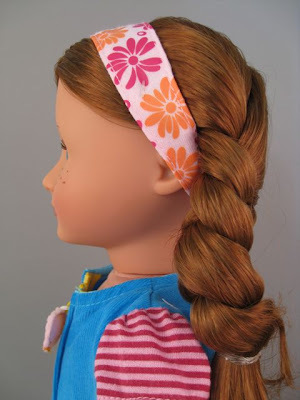 They hold up well over time, too--the Kanekalon hair is tricky to style until you get used to it, but as long as you don't sleep with the dolls, their hair looks great for YEARS, no matter how much you style it. I've never been a fan of the Our Generation dolls, mainly because of their football player shoulders and the fact that their faces usually don't appeal to me. I will say that Charlotte has one of the best OG faces I've seen. I think it helps that her lips are closed. For a while, the OG dolls had smiles with 2 teeth showing (think American Girl), but the smile didn't look natural and their eyes looked rather vacant. Just a warning: I know you're fairly pleased with the hair at this point, but beware how much you play with it. 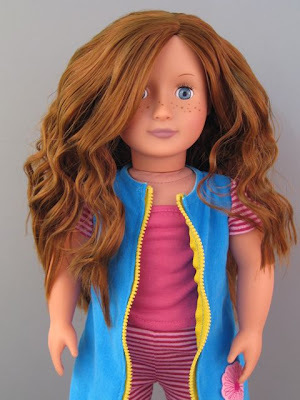 My two nieces have OG dolls and after a couple of years of normal play, their hair is a matted, disgusting mess, every bit as bad as the BFC Ink doll hair can get when played with too frequently. I even tried doing a Downy Dunk on them and had to give up in despair. It's funny, I actually prefer the faces on the Friends Boutique/My Life line. Yes, they do smell a little odd and I'm not a fan of their flexible limbs. Their hair isn't much better than the OG doll line's either, but they still appeal to me more. 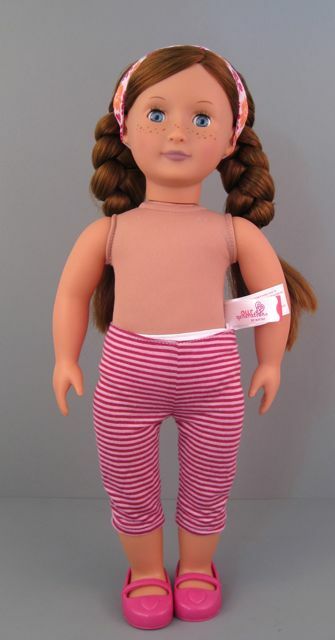 My favorite of the lines of Madame Alexander dolls sold at Walmart was the very first line they introduced, the "Friends 4 Life" series, because they had regular legs and arms and didn't smell quite so odd (I think it's the flexible, rubbery plastic of the legs and arms that causes the smell). I was so bummed out by that Walmart doll. 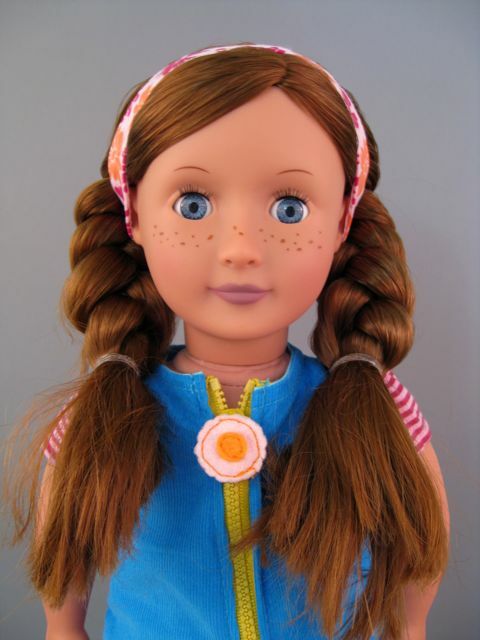 I mean, I love Madame Alexander in general, and those Friend Boutique dolls had a wonderful, classic M.A. face, but I could not get past the quality. Whoa. 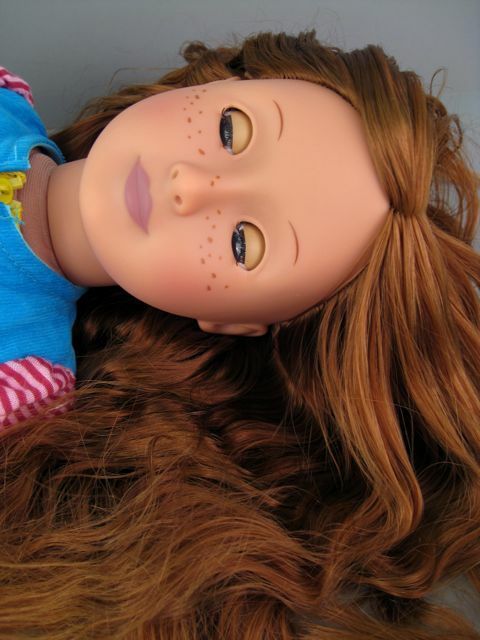 I read your review of the My Life doll and it doesn't give me a lot of hope for the newer dolls. :( Maybe I should try to seek out the older Friends 4 Life line--those sound great! 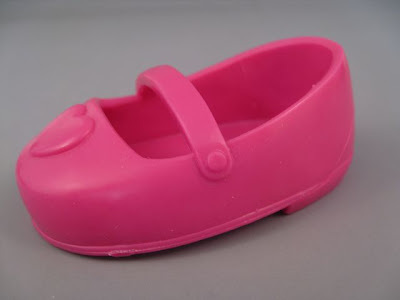 Thank you for the shoe warning, too--I might add that back into the review so that it gets noticed. 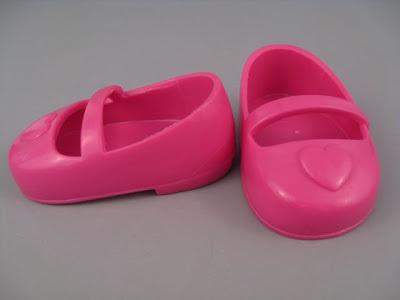 It sounds like it could be really bad to share shoes! Oh, and I totally agree about the horses. I love, love, love, love the newer articulated OG horses!! I really want one. I bought older versions of those horses for my kids when they were younger, but I think I'm the only one who played with them. :D And yes--much better than the American Girl horses...although it's hard for me to dislike any horse. I love your comments--they are incredibly helpful! Thank you for so many valuable tips and insights. 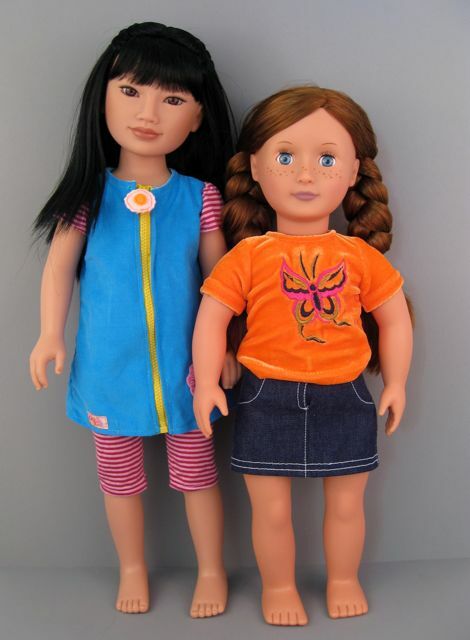 My two daughters own one pf the original Friends 4 Life dolls, and out of all the 18 inch dolls, I think they look the cutest and have held up wonderfully. Their hair wasnt great quality, but somehow (for almost 7 years or something now?) It is still really soft. And I agreaa, the OG dolls hair becomes a big mess...real fast with play. I remember when American Girls first came out with their fancy books and catalogues...couldn't afford one then, definitely can't afford one now. And at this point I think the merchandising for the AG is just so far removed from their original incarnation (as girls being spunky in the face of history) that I'm over them. 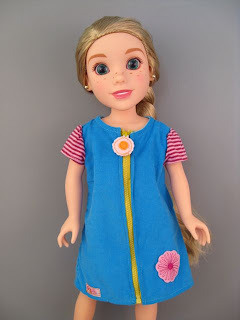 This doll seems like a cutie, but so far the only 18"-or-so-sized doll I've fallen in love with is the "My First Disney Princess" Belle in the "ballet" line? Have you SEEN THOSE? They're diabeedus in a box. The Cinderella was pretty in her ballet tutu but Belle stole my heart right away. If so, YES! She's lovely and no--I hadn't seen her before! There's a Cinderella, too??? Gah! Or...is this the doll you meant? Emily, please make sure to check out the Disney Store sometime soon! They're having their Twice Upon a Year sale right now - and most (if not all) of their Brave dolls are on sale - along with a few other things. 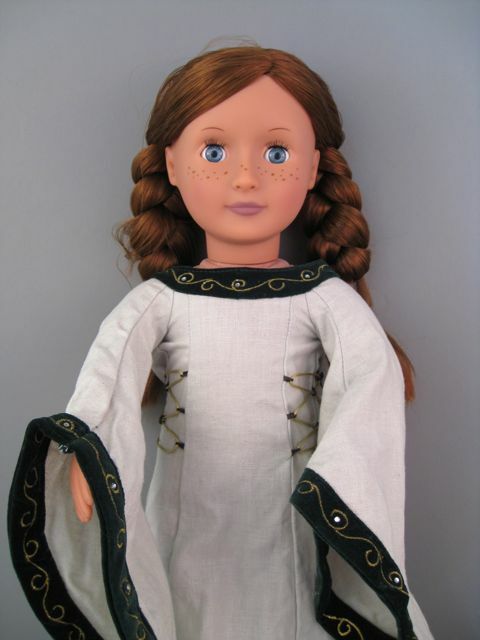 I bought a gorgeous doll of Queen Elinor this weekend for only $9.99. I want to see Ling in that Springfield dress that you said looks good on everyone. Thanks, she looks REALLY good in that dress, doesn't she? 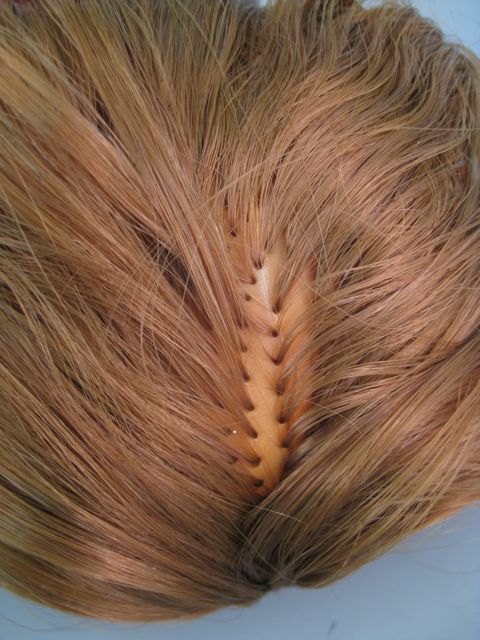 they have thick rooting in the center of the back of there head. 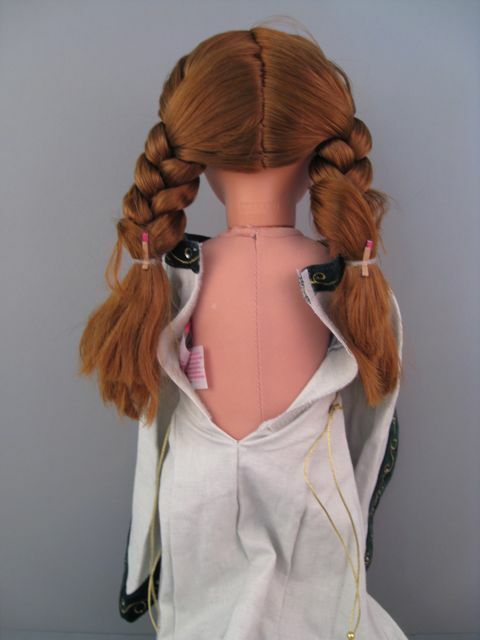 it makes for a lovely part in pigtails and braids. 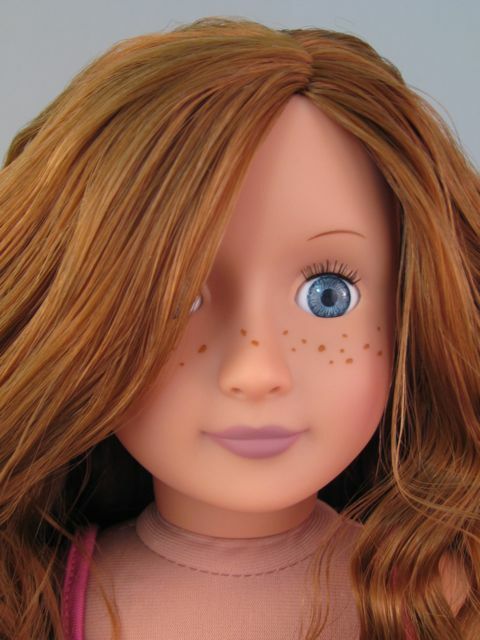 the vinyl is very soft, if you try,you can barely squeeze the vinyl on an AG doll. the limbs on the OG dolls are OK, but on mine you can squeeze the face in about 2 inches! they aren't strung with elastic. you can pull on an AG limb and it will come part-way out of the socket (don't try- it will loosen the limbs). 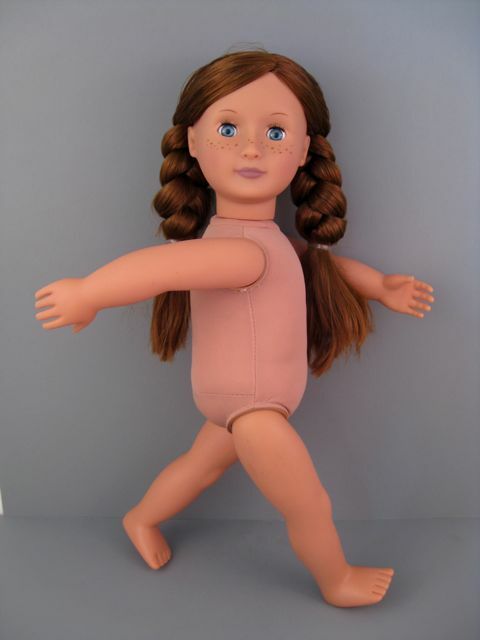 these dolls will NEVER have lose limbs because they are like this. i forgot to add that you can also curl Rebeccas hair like this. Eighteen inchers, my favorites expect for one thing, space, the very reason I don't have too many of them due to this strong desire of mine to display my dolls. I just can not leave dolls in closets and boxes, I blame watching Toy Story. For Christmas last year my husband got me AG Caroline, she grew up in Sackets Harbor in 1812. We live 20 minutes away from there so I had to have her. Plus I do love History and the books that come with the dolls seem fairly accurate describing life during that time. Caroline stands in one of my window sills and she is quite the conversation starter, here is Caroline-she is from Sackets. You can imagine more questions follow..... so unlike alot of my other dolls she really connects to the area. i don't know if you're familiar with them but this post reminds me of the teen trend dolls that were released by mattel (i think?) back in the early-to-mid-2000s. from what i remember they were similar in size but had much better articulation and overall higher quality. although i'm not sure if they retailed in the same price range. i've been contemplating buying one or two since there's a bunch floating around on ebay lately! definitely shows how different taste can be. I thought the rapunzel looked much cuter in the face and body then charlotte; although the eyebrows were a bit weird. The clothes from charlotte looked really cute on the other girls so maybe if they have clothing packs would be good cheap alternative. 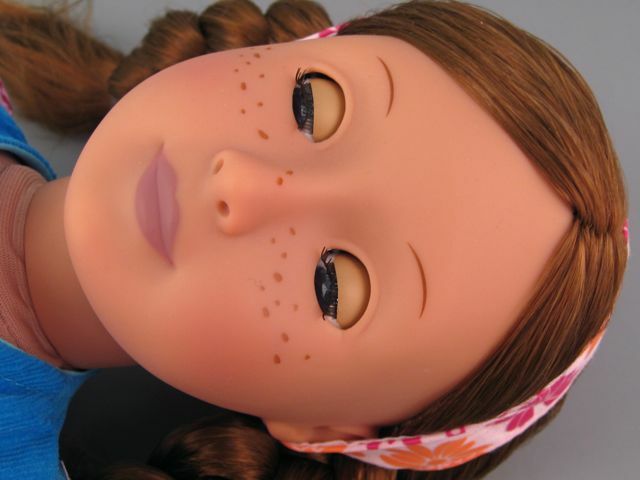 I may be weird but I love the faces of Madame Alex dolls!!! They have such a sweet , childlike look!! And you can always rewig them. 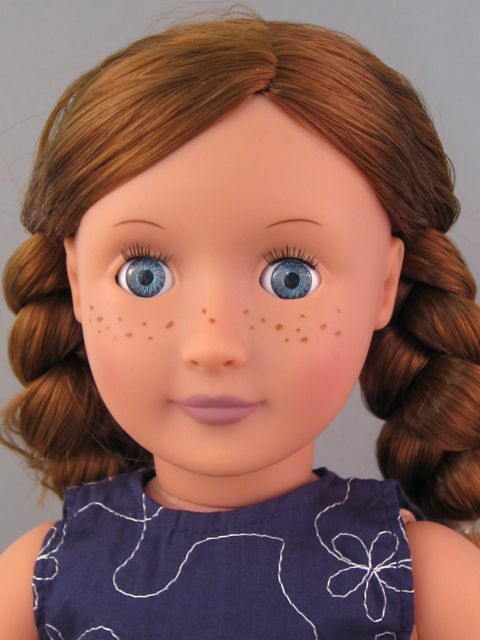 I have many American girl dolls but I think the MA faces are prettier!! Charlotte is a very pretty Our Generation doll. Love her red hair and freckles, and her outfit is really cute too. My daughter has the babysitter one, and she and the little baby she came with hang out in the American Girl house with their AG dolls. Off topic question here, but do you know if the Cutie Pops dolls are being discontinued? Target has the Swirly Brights now for 9.99 and the basic line of dolls are now just 12.99 instead of 19.99. I've been to 5 Targets and each one has no more than 2 or 3 dolls on the shelf. The also don't have the extra hair or outfits for them. There is literally a 3 foot long empty space on the shelves. Are they being discontinued or just selling really well? Thanks for your help and thanks for the great reviews! She sounds like a great quality doll! I thought she wouldn't be. Me and my sis plan on getting an Our Generation doll. Robyn has really disgusting hair. The Downy actually made it worse. 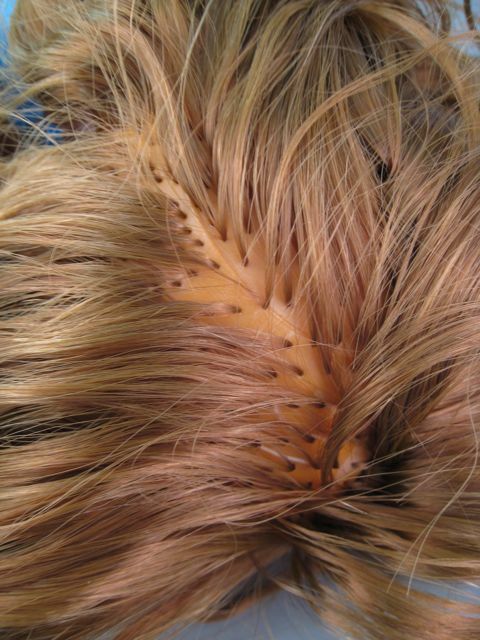 Try Johnson's baby gel I have an OG doll and used just a bit rubbed it in and used a wire brush to get the tangles out worked great, then just braid it. Thank you for sharing your thoughts on this doll, I brought the O.G. African American doll but return it because of the deep brown color on the lips and decided to buy the "my life" African American ballerina doll and she's beautiful but we only use her for decoration. 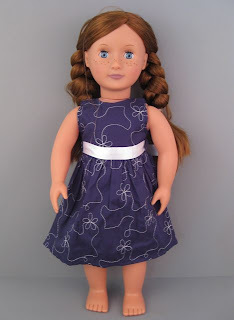 The things I like most about this doll are her bright, blue detailed eyes and her gorgeous hair. I wish my hair had that color! What I don't like are the purple lips, her clothes and her lack of aticulation . The last one is not so weird, coming from a Monster High collector like me. 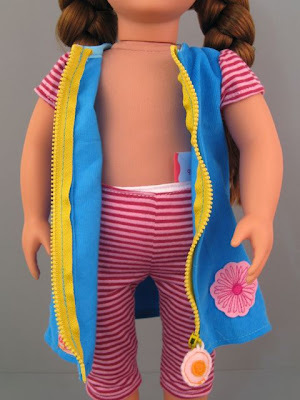 It's hard to make an articulated 18'' doll, especially with a cloth body. I think it's something you can't expect for such prizes but like you said, small children won't notice the quality shortcuts and I don't think they'd make a big problem out of the lack of articulation. In the end, it's all about helping others with buying dolls, and youself of course. 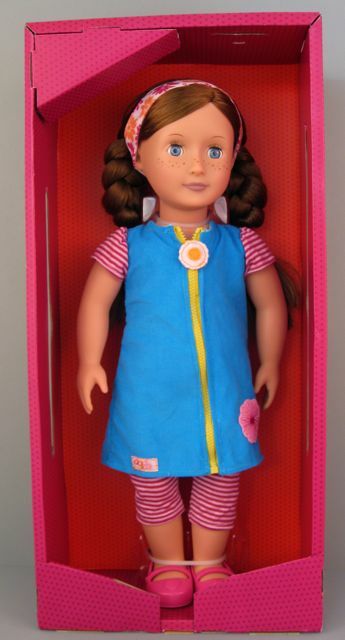 Who wouldn't want to have a large, cuddly and friendly looking doll?! I have Ayla, got her from Target in April. me too! and I got Ayla in april. I also have jenny, the baker. She has HORRIBLE hair, but after 7 years. 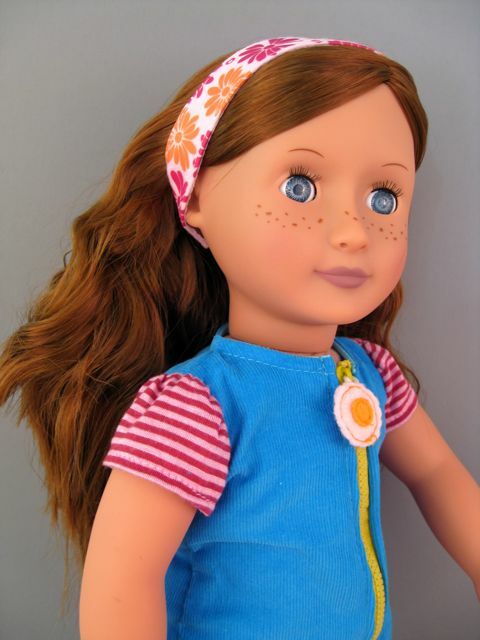 I have four Our Generation dolls (Holly, Sienna, Lana, and Neve) and the fifth one is on the way in the mail (Sadie). Neve and Sadie both have blue eyes. I haven't seen Sadie's eyes up close yet, but Neve's eyes are very different from Charlotte's. Her eyes are a medium blue with a light blue center and dark blue squiggles. Charlotte's look more crystallized. 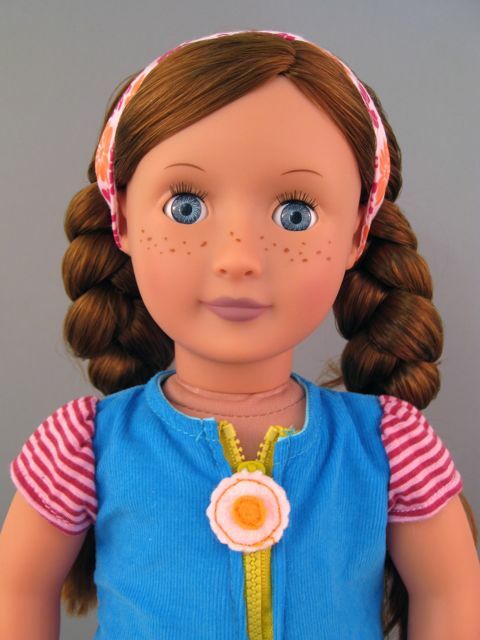 I have the OG doll "Peyton". I fell in love with her red hair which is a gorgeous color and almost down to her feet. I absolutely love her. 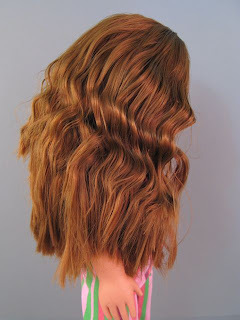 Her hair is not all one solid red color but has highlights and lighter and darker strands so it looks amazing. I am very pleased with her and am trying to decide which OG doll to get next. 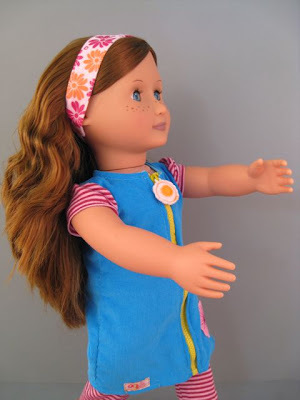 I got Peyton so I could use her as a model to sew doll clothes for my granddaughter and nieces and friends. I love dolls so I chose her out of all of the other ones. Her hair is a prettier color and any other doll that I have seen and that includes MA, AG, etc. I only have one issue with her and it is only because she has special "extendable hair" which is just a few small locks which come out of a hole in her head. I'm don't like that (didn't want extendable hair either) but Peyton has the prettiest red hair so i figured I would deal with it. The other drawback is the knob on her back that sticks out and is used to wind her extendable hair back up. 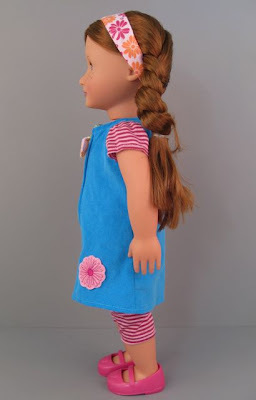 It makes it hard to use her as a dress model when i am sewing clothes for other AG or OG dolls because the knob gets in the way. (The knob and hair is much like the old 1970's doll "Chrissy" if anyone remembers). But I am very satisfied with her and would definitely buy her again. Like I said before, i am ordering another OG doll as soon as I can make up my mind which one to get. I also bought one for my granddaughter (got her Lily Anna who comes with all the horse riding stuff. 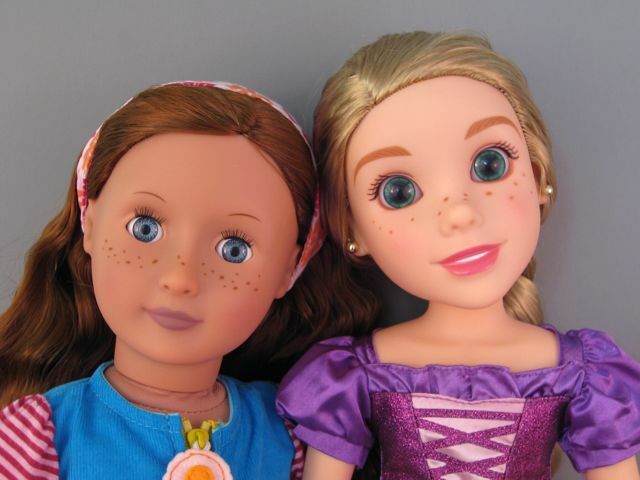 My 2 nieces will be getting OG dolls for Christmas this year too, as well as a few neighbors of mine. 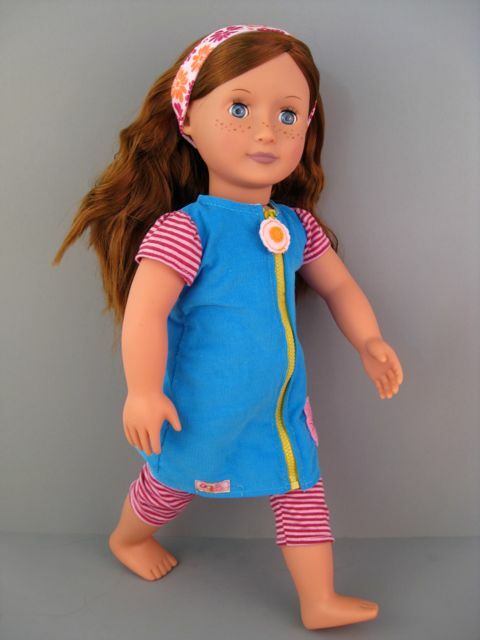 I have been recommending them to all of the parents of little girls and will make clothes for the dolls for them. Oh, I believe I just realized the dolls we have in the house from when these dolls first came out, are probably the poseable ones. What is different is that their arms are a hollow soft vinyl (that feels really weird on a doll), and I think inside the arms is some kind of a padded covered wire. That is all. 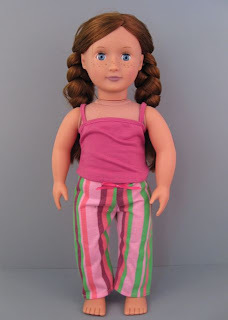 I have stayed away from these dolls for years because I really disliked the arms! I just came to understand that they now all have hard arms....which is sooo much better. The poseability was really not worth the awkward design. Hey! Brisk inquiry that is absolutely off theme, like here http://www.selfgrowth.com/articles/congratulations-it-s-a-blog-attracting-readers-to-your-new-blog Do you know how to make your site portable well disposed? My weblog looks bizarre when review from my iphone4. I'm attempting to discover a format or plugin that may have the capacity to determine this issue. In the event that you have any proposals, please share. Welcome it! This is a great review! Hey, Our Generation and American Girl have recently released a ton of items, and our generation is having a 20% off on everything. 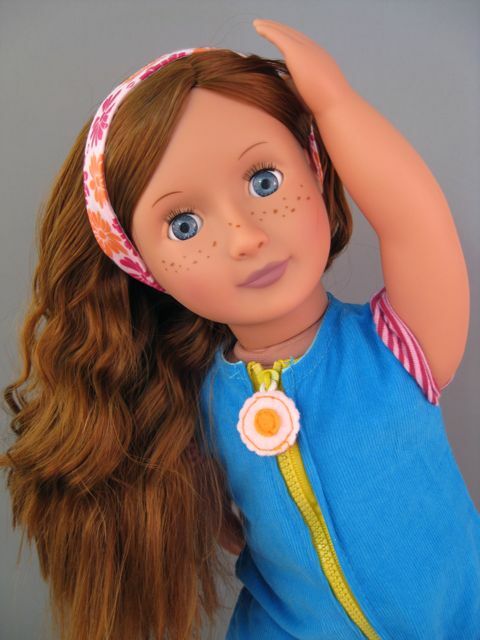 There are new redhead dolls from both companies, check them out!!! Also, I love your blog!!! 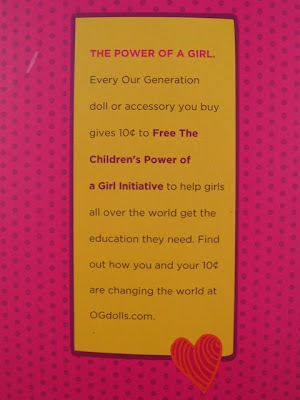 I have more of a preference for Our Generation than American girl, and not just because of the price. Our generation are eco friendly, are working for a cause, and they have poseable bodies. Im not sure about Charlotte but I know that Sia, her twin sister Sabina,Layla, Willow, and Nahla have poseable bodies. Our generation eyebrows are neutral, and if you compare the eyes and eyebrows to model year 1996 AG dolls(i have 3 of them)Og dolls are more realistic in that aspect. But just as a recap, OG have poseable bodies and AG never did. 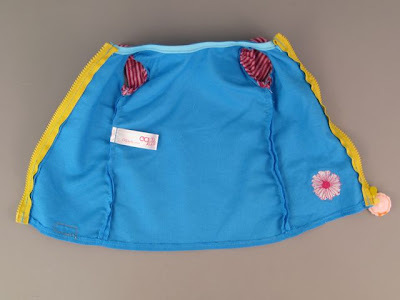 Actually I like the toy but as a youngentrepreneur in fashion industry I can already say that the quality of the toy's clothes is not very high.